How we “Go Big” and “Go Small” in order to fulfill the mission of the Foundation for a Mindful Society. When you have a mission that sounds as broad as ours—supporting people everywhere who want to bring more mindfulness into their life—it’s sometimes hard to see how some of the things we do fit in. I’d like to help clear that up. To start with, most people think of us as a magazine and a website. And of course, that’s true—up to a point. 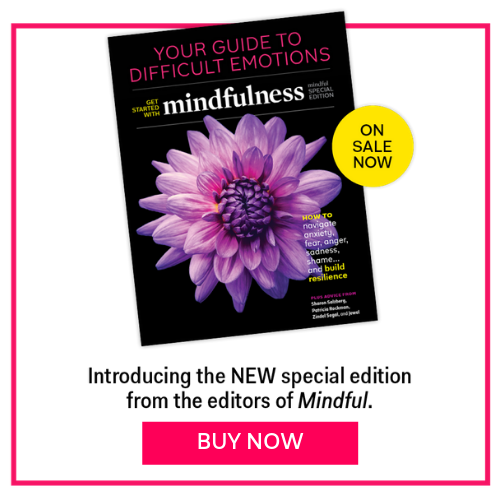 Our dedicated Mindful magazine and Mindful.org team works tirelessly to produce content to support anyone who wants to use mindfulness to bring more focus, resilience, compassion—or sometimes just a little space—into their life. That’s what I call “go small.” We create credible, accessible content to help people in need, from schoolchildren to first responders to doctors to business people to patients and people suffering from trauma, mental illness, or homelessness—whatever. And we take that duty very seriously. Mindfulness teaching and publishing requires a kind of Hippocratic oath, a commitment to helping people where they are and being careful not to create harm. That’s one reason we pay the greatest possible attention to scientific integrity. We’re very proud that we do all that, but (surprise!) we didn’t get into this work just to create a media business. We first established the Foundation for a Mindful Society 6 years ago as the nonprofit vehicle to achieve our broad mission. And since our professional expertise is in the media, we created Mindful magazine and Mindful.org as powerful tools to do just that. We’re leaning into emerging initiatives like mindfulness training for border patrol agents, displaced refugees, international care workers, and health care agencies. That’s where “go big” comes in. Our commitment to the Foundation’s mission means we show up in every high leverage conversation where we can make a difference. That’s why we’re excited about big projects like Mindful Cities and mindfulness in education, and why we’re leaning into emerging initiatives like mindfulness training for border patrol agents, displaced refugees, international care workers, and health care agencies. Of course, the coolest thing is when big and small clearly converge, which we think happens much of the time. Mindfulness in education may sound like a remote ‘big idea,’ but when you hear homeless 9-year-old Charles in Louisville tell about teaching his 23-year-old mother to “find your anchor” in a quiet corner of the shelter they live in during one of her rare breaks between her school classes and her job, well, it becomes very immediate. One such convergence is our emerging project to help bring mindfulness training to federal firefighters by providing support to the inspired work of MBSR teacher and lifelong firefighter Michelle Reugebrink and her insightful, innovative bosses at the US Forest Services. We read about the homes and lives lost from the fires in every part of the country but less spoken about is the stress, trauma, and life-pressures suffered by the brave women and men who fight those fires on our behalf. We receive many inquiries from folks across the country with projects and inspirations just like this, folks who want information, counsel, support, guidance, and assurances to know they’re doing their very best in how they bring mindfulness in to help improve the lives of the folks in their communities. We want to be there to help them. The challenge for us is that that the ‘go big’ projects don’t often fit a media economic model. For example, we won’t necessarily sell more magazine subscriptions or advertising with our Mindful Cities project. But when we see the opportunity to bring mindfulness to all aspects of our society we can’t help but do it. And further we can’t leave this mindfulness social innovation work solely to the for-profit mindfulness world. There’s often no business incentive where mindfulness addresses social challenges in our society. And we’ve already seen visionary mindfulness business founders displaced by investors, as well as questionable new products introduced to meet investors’ sales goals. It’s your support—from individuals, foundations, and anonymous donors—that makes it possible for us to do this mindfulness-based social innovation work. While the media operation can be self-sustaining, our efforts to support the go big projects are only possible through your vision and generosity. Gosh, I didn’t start the Inside Mindful blog to do fundraising. But funding the ‘go big’ work is important for us to fulfill our mission. It’s that time of year, and the opportunity for you to help is immediate, so thanks for letting me rant. Your small donations make a big difference, your big donations mean that much more. Go big and small with us.